This recipe is basically a hug on a plate. It's a delicious and healthy meal that kids of all ages love. My mom made this for us when I was growing up and now I'm making it for my family. That's 7 kids eating this meal over 30 years without a single complaint! Tess even does a happy dance in the kitchen when she finds out we're having it. 1 Brown the sausage and drain off any fat. Break up any large pieces (you want the pieces to be bite-sized for your kids). 2 Chop the potatoes and apples into 1 inch chunks. You don't have to peel the apples or potatoes unless you want to (I just let my kids pull the skins off at the table). 3 Peel the onion, cut it into wedges, and separate the petals. 4 Mix the sugar, corn starch, cinnamon, salt, and water until blended. 5 Layer the potatoes, then onions, then apples into a 9x13 baking dish. Sprinkle the sausage on top. Pour the water mixture over the whole thing. Cover with foil and bake at 375 for 50-60 minutes. • I usually serve this meal with a lightly dressed salad, but if I'm feeling nostalgic, I open a few cans of green beans just like my mom did. 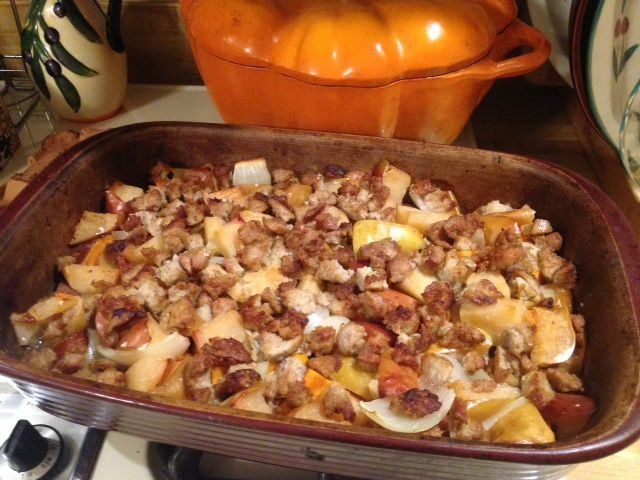 • If you're really in a hurry, you could buy prechopped sweet potatoes, presliced apples, and precooked sausage. • We usually eat this for dinner, but it would be a yummy brunch dish, too. It also reheats really well for leftovers. Just cover the dish to keep the sausage from getting dry. • This recipe is a little high in sugar, but it's mostly fructose from the fruit and veggies. The sugar in the sauce mixture could be eliminated, or you could substitute winter squash for the sweet potatoes if you're really watching your family's sugar consumption. The squash will probably take a little longer to bake. • If sodium is a concern, you can eliminate the salt from the sauce mixture and choose a lower sodium sausage. • I've tried this recipe with 99% lean sausage, and it really wasn't very good. It was dry and I just didn't feel satisfied after I finished dinner. I recommend sticking with regular turkey or chicken sausage. I hope your family enjoys this recipe. See you next month. Happy, healthy eating!